Cnut the great returned to England, at Sandwich he unloaded a mighty army, a source mentions 2000 ships, 800 ships according to the Jomsvikingsaga, Adam of Bremen mentioned 1000 ships. 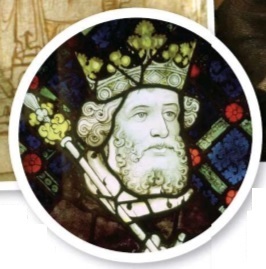 Harald 2 had helped his brother equip the viking fleet and a lot of vikings came from Norway and Sweden to join the 20 year old Canute the great in the conquest of England. 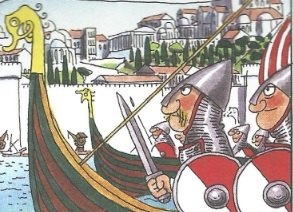 The Norwegian vikings was led by Earl Erik(Brother-in-law of Canute the great). The Danes was again successful and before the winter was over most of Wessex was conquered, and Mercia was attacked. While Harald 2 was securing the Danish kingdom and Cnut the great was busy conquering England, a new threat came to the North sea empires third kingdom: Norway. 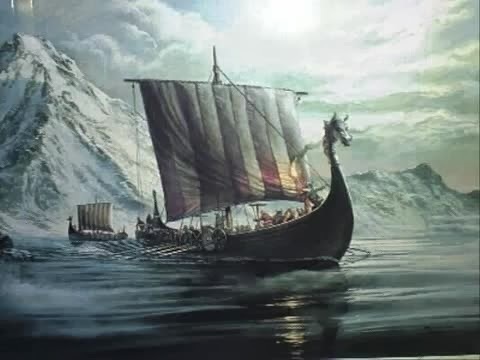 Thorkil the tall had in the period he served the English king a Norwegian chieftain Olaf the holy Haraldson( a descendant of Harald fairhair)under his command, Olaf the holy sailed back to Norway to conquer the throne. Berserkers = Individual Viking warriors known for their extreme ferocity. The berserkers are one of the least known aspects of the Viking society. These were vikings who fought in such a rage that they lost all sense and became homicidal maniacs who attacked everyone in sight. The word berserker has a disputed meaning. It has been suggested that it comes from the term “bare-sark,” meaning “bare of shirt,” or without armor. References to the berserkers mention their lack of any armor. Another explanation is “bear-sark,” describing the wearing of animal skins. 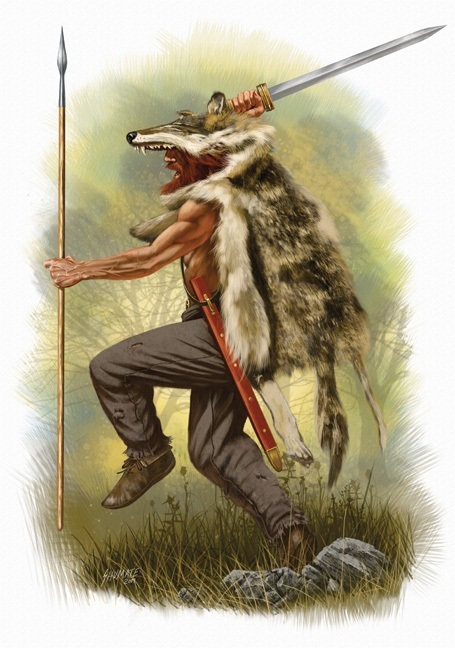 Bearskin would seem to be the logical choice of fur, but in some of the sagas the berserkers are called “Wolf- Skins” or “wolf-coats” (ulfhedinn). The berserkers are often associated with Odin, this kinship with Odin is common in many of the tales about the berserkers. One tale was that, like Odin, they could change and become animals, and assume wolf like or bearlike qualities. An explanation for going berserk comes from psychiatry. The theory is that the groups of warriors, through ritual processes carried out before a battle (such as biting the edges of their shields), go into a self­induced hypnotic trance. In this dissociative state, they lose conscious control of their actions, which are then directed subconsciously. People in this state seem remote, have little awareness of their surroundings, and have reduced awareness of pain and increased muscle strength. Critical thinking and normal social inhibitions are weakened, but the people affected are not unconscious – they act on direction; they kill enemies. Hrolf’s Saga describes the hero Bjarki taking possesion of a bear in battle and killing more men than 5 warriors. Georges Dumezil, in Gods of the Ancient Northmen (1973), describes this phenomenon as the hamnigja, the spirit of the animal appearing in dreams or visions as well as in reality. The berserkers were also reputed to have had an immunity to weapons, either naturally or through supernatural powers. This quality is described in many of the sagas. It could possibly be explained by the thickness of the animal skins they wore as protection or their blind fury that ignored any feeling of pain or wounding. Either way,the sight of berserker warriors receiving what should be mortal wounds and continuing to fight certainly had a strong psychological effect on their enemies. The berserkers may have belonged to a cult of Odin, whose practices and spells would have been revealed only to initiates. Emperor Constantine VII of Byzantium(905-959), who employed Vikings in his Varangian Guard, noted a dance his men engaged in while wearing animal skins. This could indicate that it was a performance of cultish rites. Such a dance is also recorded in artwork on Swedish weapons. A beginner member of the cult is sometimes described as having to undergo an initiation into a warrior band whereby he has to fight a bear. It was also told by eating the mushroom Amanita mucaria, the beserkers could gain their supernatural powers. A raid led by Olaf Haraldsson, who later became king Olaf 2 the holy of Norway. He destroyed four major Galician towns: Castropol, Betanzos, Rivas de Sil and Tui. And then attacked La Coruña in Galicia and then sailed into the mouth of the river Minho, created a camp and at Tui, he demanded 12,000 gold shillings (4 kg of gold) for not destroying the town, but the town was destroyed. Vikings captured bishop Alonso and many church folk and held them for a ransom. This was later told by the Skald Ottar the black and Sigvat. Yaroslav the wise became new ruler of the Rus until 1054. Olav the holy refused to listen to the skjald Sigvat, Sigvat ignored it and he recited his poems in front of Olav the holy.